Both the design of lifeboats and their deployment method are geographically informed. In many locations it is not possible to house the vessel near to its launching place; before the march of the internal combustion engine, horse power was required to get it there. On the Dutch Frisian Island of Ameland, that tradition well outlived the normally considered practical use of the horse as a beast of burden. The memorial at the start of the video is to the 8 horses that drowned on 14 August 1979 while launching Reddingsboot Ameland into the North Sea. Although best known for his work with the RNLI, which the company he founded continued through to the design for the relatively recent Arun Class, G.L. 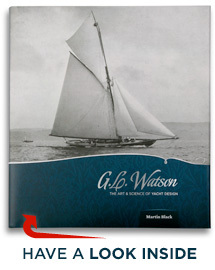 Watson also designed lifeboats for other countries, including the sistership steam-hydraulic lifeboats President van Heel (1895) and Prins van Nederlanden (1909) for Zuid-Hollandsche Maatschappij tot Redding van Schipbreukelingen. Both capsized when on duty in extreme coastal conditions, with heavy loss of life. President van Heel went back into service and, as far as we can tell, still exists as a private yacht, perhaps with her original steam engine. Prins van Nederlanden was decommissioned after her tragic misfortune in 1929; it has recently been discovered that she also was converted to a yacht. This entry was posted in film, G.L. Watson, G.L. Watson & Co., G.L. Watson clients, Lifeboat, Martin Black, object of desire, RNLI, Uncategorized and tagged President van Heel, Prins van Nederlanden, Reddingsboot Ameland, Zuid-Hollandsche Maatschappij tot Redding van Schipbreukelingen. Bookmark the permalink.